The one that started it all. 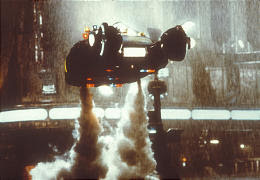 Sir Ridley Scott’s Blade Runner, starring Harrison Ford, is one of the most important science-fiction movies of the 20th Century — the film with immeasurable influence on society for its futuristic depiction of a post-apocalyptic, dystopian world, a film perhaps more powerful and relevant today than when it was made. The film, in fact, has appeared on more ‘Top Five’ sci-fi lists than any other film. In celebration of its 25th anniversary, director Ridley Scott (Alien, Hannibal and a three-time OscarÂ® nominee, Best Director, for Gladiator, Thelma & Louise and Black Hawk Down) has gone back into post production to create the long-awaited definitive new version, which Warner Home Video will unveil on DVD December 18th in the U.S. Blade Runner: The Final Cut, spectacularly restored and remastered from original elements and scanned at 4K resolution, will contain never-before-seen added/extended scenes, added lines, new and improved special effects, director and filmmaker commentary, an all-new 5.1 DolbyÂ® Digital audio track and more. Simultaneous HD DVD and Blu-Ray versions (each $TBD) of the “Deckard Briefcase” will also be released in numbered, limited quantities. HD DVD and Blu-Ray 5-Disc Digi Packs with collectible slipcase (each $TBD) will include all of the UCE content. Ford, Rutger Hauer, Edward James Olmos, Joanna Cassidy, Sean Young and Daryl Hannah are among some 80 stars, filmmakers and others who participate in the extensive bonus features. Among the bonus material highlights is Dangerous Days - a brand new, three-and-a-half-hour documentary by award-winning DVD producer Charles de Lauzirika, with an extensive look into every aspect of the film: its literary genesis, its challenging production and its controversial legacy. Finally, director of “Trainspotting” and “28 Days Later” Danny Boyle’s new film “Sunshine“opens in the U.S. Friday, July 30th. It first premiered worldwide the same weekend as “300” in March. Critically well-received, audiences generally overlooked this cross between “2001: A Space Odyssey,” ” Alien” and “Fitzcarraldo .” Itâ€™s set 50 years in the future: the sun is near death, and so is everything on Earth; a crew of eight men and women (including actors Rose Byrne, Chris Evans, Cillian Murphy and Michelle Yeoh ) attempt to deliver a device to the sun that will reinvigorate it, but they find their sanity waning as they get further and further from their own planet. A new breed of scholar is flocking to UC Riverside for otherworldly research, says LA Times’ Sara Lin. UC Berkeley has the world’s premiere collection on Mark Twain — and Yale an unmatched trove of rare medieval manuscripts. But for research on Capt. Kirk, Frankenstein or Harry Potter, nothing tops the 110,000-volume Eaton collection at UC Riverside, the world’s largest library of science fiction, fantasy and horror books. “It’s like going to Graceland if you’re an Elvis fan,” said Drew Morse, a creative writing professor who made the pilgrimage to Riverside from Ohio last summer to study rare poetry by “Fahrenheit 451″ author Ray Bradbury. Wellington is one of several devotees who, given the chance to vent, expresses enthusiasm as well as skepticism at the current state of the genre. Many view the landscape ahead with caution, fearing a post-apocalyptic vista mottled by computer-giddy graphics and the blunt force of mainstream taste. Some see it fragmenting. Others see it thriving. A court ruled Friday that a Chinese science fiction writer did not have enough evidence to prove that 20th Century Fox stole his ideas when making the 2004 movie “The Day After Tomorrow,” state media reported. Science fiction author William Gibson (who coined the term “cyberspace”) promotes his latest novel Spook Country in Second Life . Stay tuned for Gibson SL activities, from film screening to an avatar competition. Just when TV viewers may have had their fill of summer escapist fare, ABC brings to the air a series of four original films as current as today’s headlines, but with all the wonder and imagination of the best sci-fi literature, with the 10 p.m. Aug. 4 debut of “Masters of Science Fiction,” Starz Media’s John W. Hyde and Industry Entertainment’s Keith Addis jointly announced today. The climactic Harry Potter book comes out next week. Patrie Davis awaits it as do legions of others. Odd as that alone may seem, Davis, of Jeffersonville, takes it one leap further. She writes just as devotedly. Hollywood films featuring genetic mutations, bioweapons and mad scientists generally do little to educate Australians about biotechnology, a study has found. Star Wars science fiction film fans look at scale models at the Star Wars Celebration Europe event in London. Fans were out in force for the giant European Star Wars convention celebrating 30 years since the epic film saga all began, a long time ago, in a galaxy far, far away.